A new batch of Northern Ireland footballing heroes came of age last night in Lyon. The hard fought 2-0 win over Ukraine was the country’s first ever at a European Championship - and the first at a major tournament since ‘that’ win over Spain in 1982. A 20,000-strong Green and White Army had marched on Lynon and they sang their hearts out in praise of Michael O#’Neill’s battlers. Thousands more ecstatic fans watched the game on a big screen at the special Titanic fan zone in Belfast. Goals from Gareth McCauley and Niall McGinn gave the team a good chance of progressing into the last 16. The team play their final group match - against world champions Germany in Paris on Tuesday. French police have confirmed that a Northern Ireland fan who collapsed in the closing stages of the team’s Euro 2016 victory over Ukraine has died. 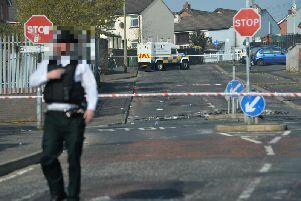 In a statement released last night, a PSNI spokesman said the man was aged in his 60s and from Belfast. Superintendent Nigel Goddard, who is working in France alongside the local police, said; “Our thoughts are tragically with a second family this week mourning the devastating loss of their loved one. We understand the man aged in his sixties collapsed during the game and was attended to by emergency services in the Stade de Lyon. A Northern Ireland sitting just feet away from the casualty used Facebook to say that medics erected a screen while they fought to save his life. Pictures have emerged from France of flags placed at the spot where he collapsed as a tribute. One Northern Ireland fan from Portadown said he was left with “mixed emotions” following his team’s 2-0 victory - the first at a major tournament in 34 years. The fan said: “Unfortunately he did not see the [first] goal or the win, but the Green and White Army done it for him. “Was honoured to leave my flag on the gentleman’s seat”. The Irish Football Association has said it is “deeply saddened to learn of the sudden death of a Northern Ireland fan at this evening’s game” at the Stade de Lyon. News of the stadium fatality comes just days after 24-year-old Ballymena man Darren Rodgers fell to this death shortly after Northern Ireland’s first game of the tournament in Nice against Poland. Mr Rodgers is understood to have been alone when he fell onto a rocky beach.